Pegasus Lodge - entertainment area with internet TV, bluetooth speakers and wifi. UPDATE: Due to the way Auckland Council has implemented their new rates on on-line accommodation providers, we are no longer taking any online-accommodation bookings; e.g. on AirBNB, Bookabach or HomeAway. 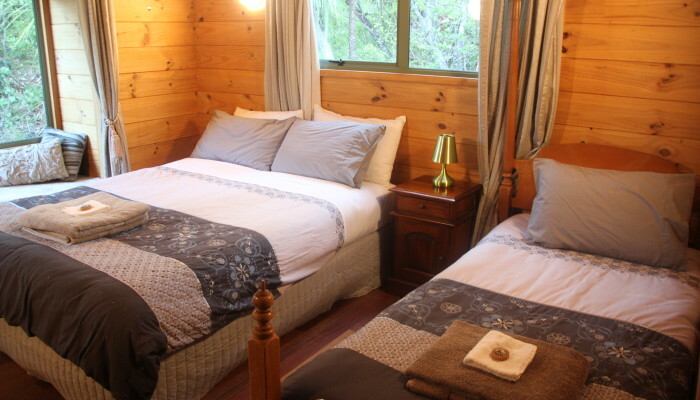 Pegasus Lodge is a large, stylish and spacious lockwood lodge, that comfortably sleeps 12 people, making it perfect for hosting family groups. Children are most welcome and high chairs, cots, toys, books, games, swings and hammocks are provided free of charge. The entertainment area includes a bluetooth & internet-friendly flat screen television. With large sofas and lots of extra blankets available, why not gather the young ones up, close all the curtains and let them escape into a favourite movie, day or night. 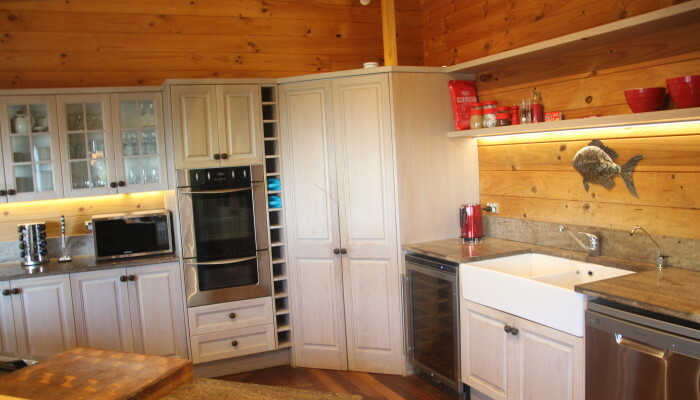 The large kitchen makes hospitality a joy, with a nespresso coffee machine, wine fridge, microwave, gas hob, F&P fridge/freezer, spare fridge, double oven, dishwasher, toaster, kettle and even more facilities (see below). Sit around the enormous table inside (seats 12) or on the deck to enjoy the ambience. If you really want to relax, just stay in the soft and scrumptious dressing gowns that we provide, all day! 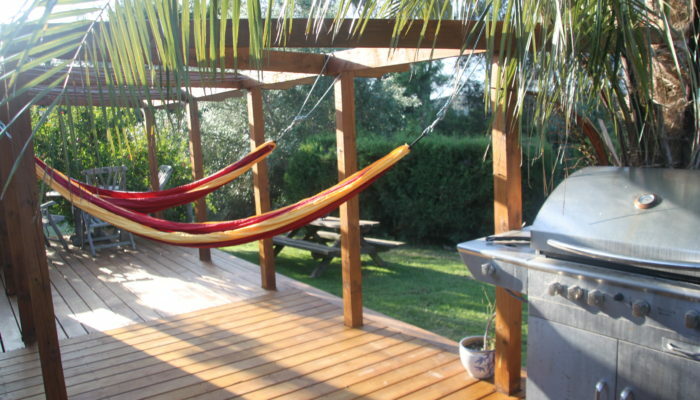 In the evening have a BBQ on the 200 sq metre deck, with views of the sea. 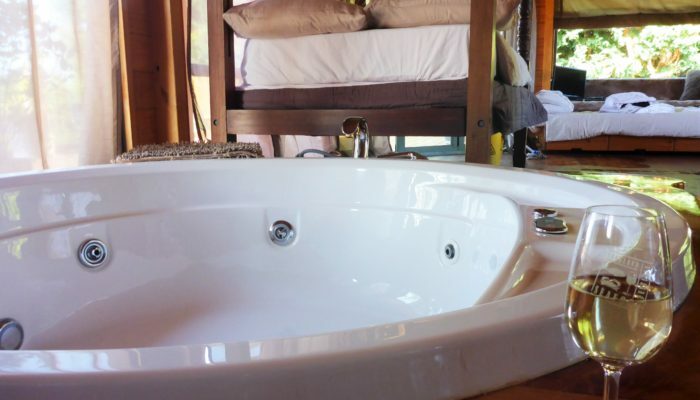 Take a stroll through the property’s olive grove and orchard, or finish the day with a spa bath in the master bedroom. 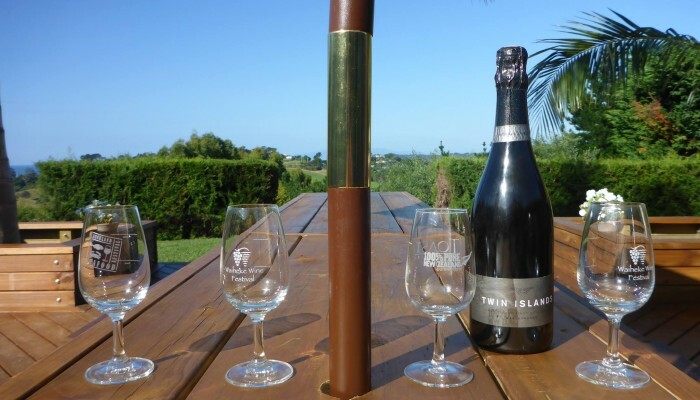 Look across the Onetangi Wine Valley and decide which award winning restaurant or vineyard to walk to next. Check out the restaurants nearby, or drive to the lovely Onetangi Beach complete with cafes and playgrounds. And to top off your holiday, we also offer a free ‘farm tour‘. Our guests really enjoy meeting and feeding the sheep, chickens, horses, pigs, rabbits, goats, ducks and doves; and we love showing them to you. Set on a tranquil hilltop, surrounded by 15 acres of vineyards, olive groves and orchards, there is plenty of space for relaxing, exploring and spending quality time with family and friends. Book your stay at Pegasus Lodge now! 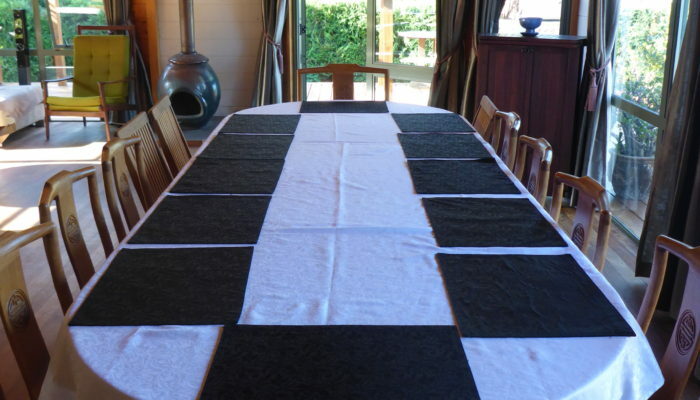 “I recently had the pleasure of staying at Pegasus Lodge with a group of friends and we had a fabulous time. 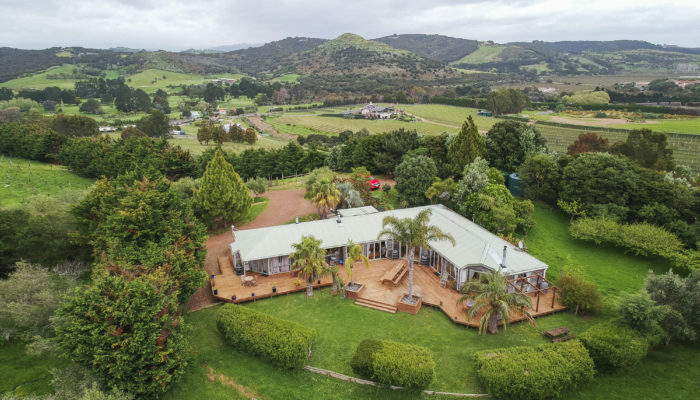 It’s a great location with lovely views over the vineyards and the open plan style lends itself to entertaining, especially the flow through into the huge open deck. We also loved the spa in the ensuite and the fact that we could open French doors making it an inside / outside experience. Thank you Katherine for making our visit so welcoming and we loved feeding the pigs with you. 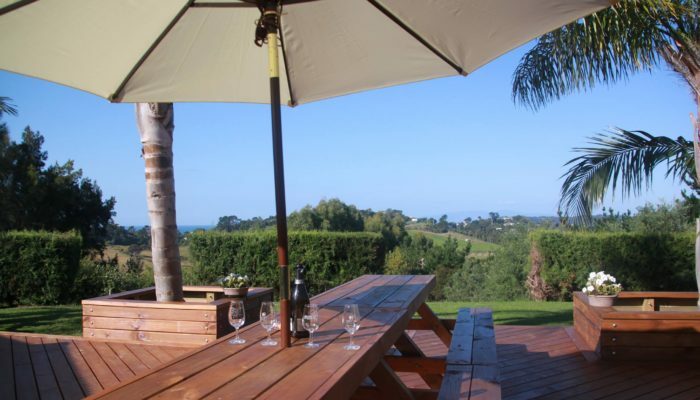 I would definitely recommend this to anyone looking to stay on Waiheke Island with family or friends” (10 Dec 2015, Trip Advisor). Bus stop directly at our gate—but it’s a bit of a long driveway! Pegasus Lodge was a fantastic venue for our small family wedding. 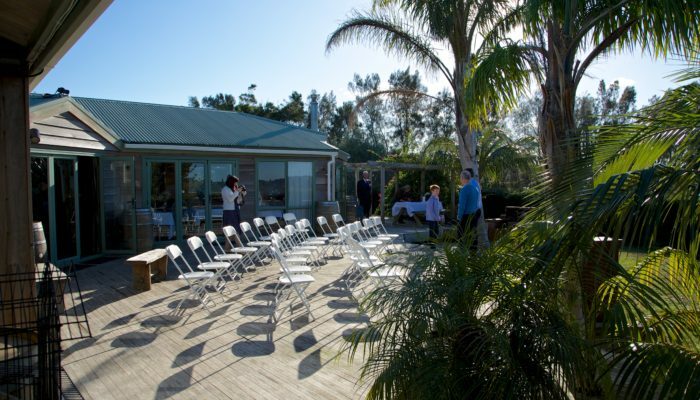 The ceremony was held on the back deck, and reception with 32 people held inside. Photo shoot ranged over the farm with vineyards and animals playing a role. Family also stayed at the two other cottages on Katherine’s property. We were all delighted! 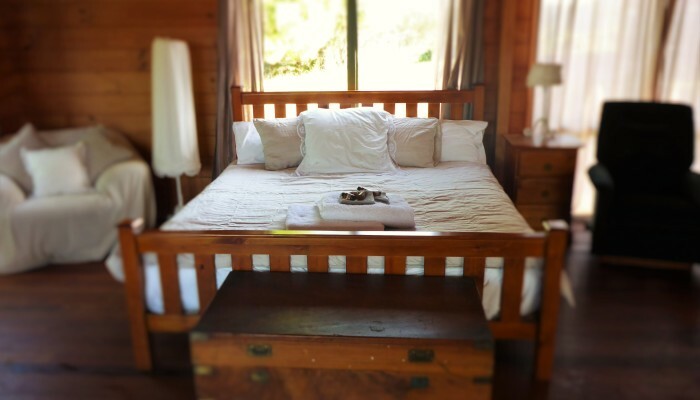 Our stay at Griffin Cottage was simply fantastic! Both the interior and exterior of the house have been wonderfully maintained and are beautiful. Katherine was a wonderful host who takes a lot of pride in looking after her guests. We can’t wait to come back! 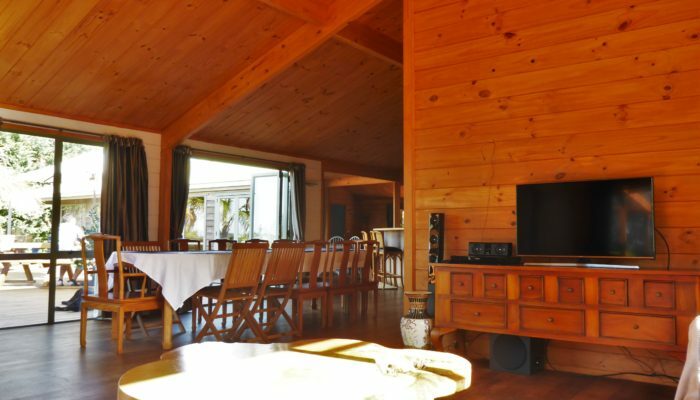 Pegasus Lodge is a great location with lovely views over the vineyards and the open plan style lends itself to entertaining, especially the flow through into the huge open deck. We also loved the spa in the ensuite and the fact that we could open French doors making it an inside+outside experience. A group of 10 stayed at the fabulous Pegasus Lodge. It was absolutely sublime, peaceful and huge. We were only a small car ride away from all the beaches. I would recommend it in a heartbeat and wish I could have stayed longer—loved it, loved it. Katherine was absolutely fabulous, such a pleasure and she couldn’t have helped us more. She worked with our group of 10 and offered us the world of information about Waiheke. Gold Star treatment. The trip over to Waiheke was easy, and made even easier by the kindness of Katherine helping us along the way. Pegasus Lodge itself is luxurious, spacious and has everything you could possibly want, but also feels relaxing and cozy. We loved meeting all the animals and exploring the area and strolling down to Stonyridge vineyard for lunch was easy as well. The girls and I had such a wonderful weekend away here. Wonderful accommodation, location, people and animals. We will be back! Cosy get together was fantastic. Great place to bond—all 12 of us! Great to be a big family in a beautiful house, thank you. Thank you so much for making our stay a “home away from home.” The beauty of your facilities would have been enough but you went above and beyond. The girls loved the animals and those from Dubbo loved your hills! We all enjoyed our stay and will do our best to send more Aussies your way. Thanks again. 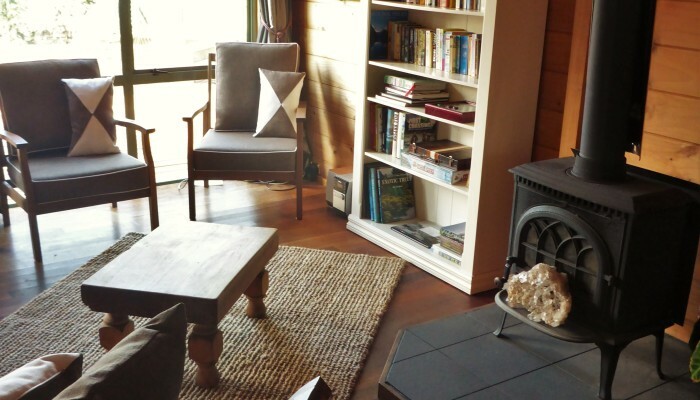 Nothing beats staying in the warm cosy lounge with the family and enjoying a fantastic weekend with local Waiheke views. 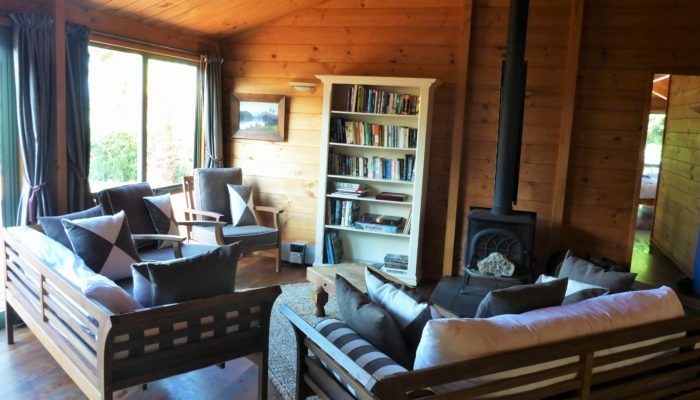 Spacious and well laid out, family orientated with a taste of luxury, Pegasus Lodge certainly represents the best of NZ luxury holiday homes. Thank you so very, very much Katherine and Dan, I had the best 30th ever!! This is the most beautiful spot, house and experience, you absolutely blew us away with your kindness. Loved the animals and strolling across to Stonyridge was so easy and fun. Thanks for everything, we wish you all the best and hope to see you again. 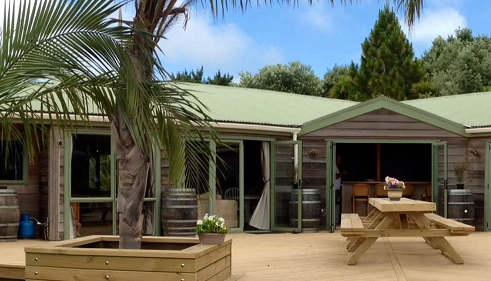 Pegasus Lodge is a great base to explore Waiheke Island. Thank you Katherine for your assistance, kindness and care. We had the best relaxing girls’ weekend away and we will definitely be back! The animals were a great hit with the children and they really enjoyed running and biking on your big deck. Waiheke is paradise. Thanks again. Thank you so much for the beautiful space. Amazing and very relaxing. What an amazing place for an all girls party! Hope to be back one day and thanks for the great communication. Such a fantastic weekend! Had such a lovely time in this picturesque lodge, so many great moments. Thank you so much for having us! Perfect holiday spot and sanctuary for time away from the City…wonderful hosts and love the animals—highly recommended and will definitely be coming back! Beautiful setting, location, retreat-like; ideal for family reunion and 60th birthday. Plenty of room for 8 adults and 2 children; kids loved seeing the animals and learning about them. What a fabulous place! Onetangi beach and surrounding bays are great, and visits to the vineyards were wonderful. 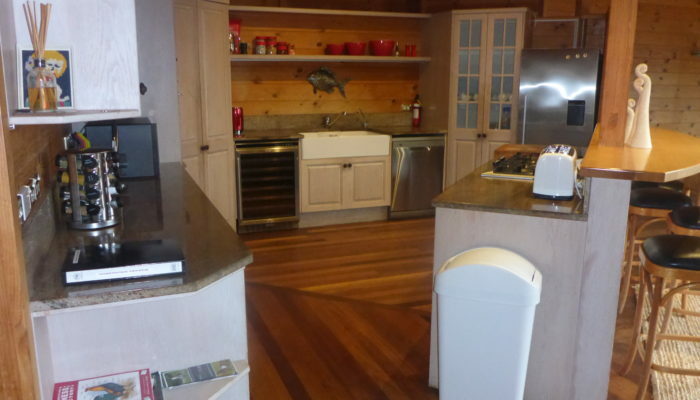 The house is just perfect for entertaining family or friends as it is so well equipped. I don’t even have words for how amazing our stay with Katherine at Pegasus Lodge was. The whole property is gorgeous…the vineyards, olive tree groves, and the views are to die for. It’s walking distance to their nearest neighboring vineyard, Te Motu, so we went over the morning of our wedding for a wine tasting which was beyond fun. 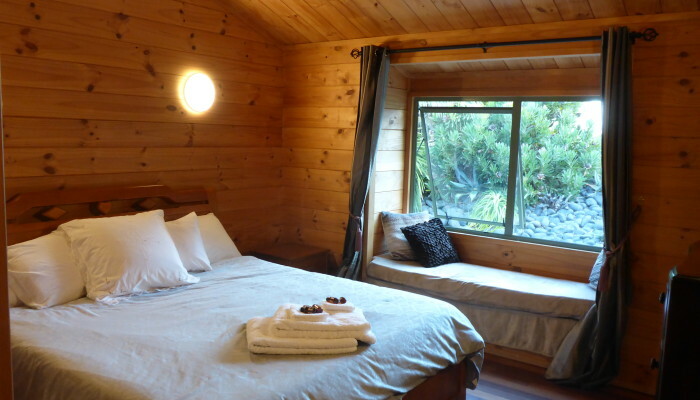 We’re already planning a trip back to New Zealand, and when that day comes we will absolutely be staying at Pegasus Lodge again—hopefully for even longer! 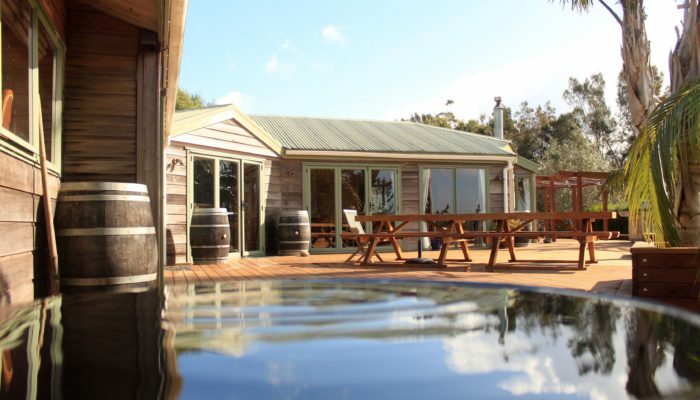 Not only is this cottage set against one of the prettiest landscapes of the island, complete with the most lovable of farm animals, there are some great wineries nearby. If I get the chance to come back to New Zealand again, I’ll definitely be doing another visit to Waiheke just for the experience alone to stay at this location. Wonderful place to relax, great layout which works well. We had a fantastic holiday, great hosts and we loved the animals.